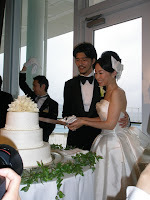 I went to the wedding reception for Mrs. Reiko Yoshida who is a writer for magazine, Classy. Gladly, I was able to create a wedding dress for her! It took 2 months to complete and we had many meetings to discuss details such as silhouette or fabric. 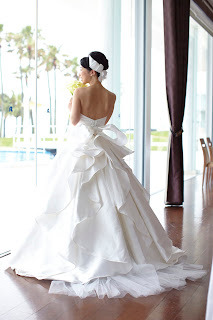 We chose thick silk taffeta from Taroni in Italy. I created sketch design to begin with and finishing it accordingly. I was always excited and felt special to producing it as I could also work with my favorite pattern making and sewing people I have worked for NY collection in the past. It is an absolutely show piece and special dress! I did tacking twice and checked silhouette with sheeting. As matter of fact, under dress was good enough to wear as it is. It is all haute couture from crinoline to corset! Her happy face made us excited at fittings every time. The wedding party was so wonderful! I and our staff were so horned to be a part of such a great couple's special day!! Wishing her a happy married life!